A map of the world on the wall behind it is refracted through a water droplet. Check out the strange and wonderful world of Martin Waugh's Liquid Sculpture. The images are stunning, and had me scratching my head many times, smiling at others. My favourite is the World at night; similar to the one you posted, but more appealing to my artistic senses. I would also like to congratulate Martin on creating a photo site with Flash that is actually a pleasure to use. Very cool! Thanks for sharing Martin's work. While I have the utmost respect for the fortitude and expertise it takes to make these stunning images, they leave me rather cold. 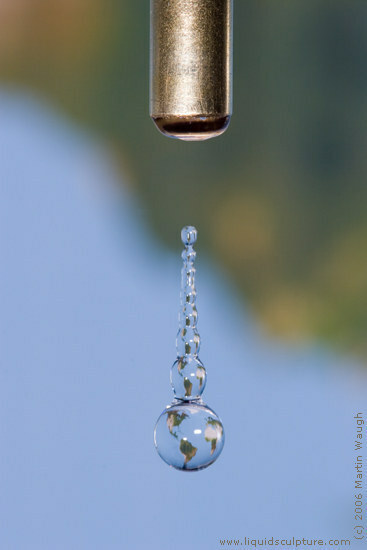 Graphically they are astounding and have broken any idea of the water drop photo being cliche. Respectfully not my cup o tea. I liken it to glass blowing, impressive, time consuming but just not my cup of tea. Though I do have the personality that could sit around for hours an tinker with various viscosities (adding sugar and such) just to see what would happen. In fact I shot a book cover once that required a wedding ring to be dropped into a shot glass and the splash created by the "whisky" (actually earl grey tea) to be frozen in mid air. It took about 400 shots, 1 ring, and 3 different glasses to get the perfect look. Tedious to say the least. Personally, I find the water droplet overused in the print world (I'm guilty too). I've seen about 3 iStock droplets used 50 different ways in the self help section of Borders alone. Then there are the glossy magazine adverts pushing booze... It reminds me of the Polaroid,4x5, 35mm film borders that you see in outdoor magazines to make their photos seem more "edgy". It was slick when it was new but now I'm overexposed and tired of it. Fine technical work. Waugh's droplet images are beautiful but, well, they've become rather cliché since Harold Edgerton's work. Nevertheless, Waugh expands nicely on the genre by using creative lighting, color, and bokeh imagery. 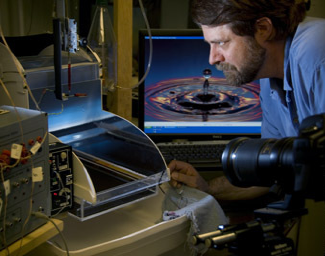 Waugh's real masterpieces are those refracted droplet images, such as that global droplet image.